COME TO WROCŁAW FOR THE 10TH EDITION OF THE EUROPE ON THE FORK FESTIVAL! The time between May and June is going to be pretty warm and sunny, as they say! And the temperature in Wrocław should even reach beyond the magical 25 degrees! What does suggest you? A short break from the work life sounds not too shabby, doesn’t it? So, come to the capital of Lower Silesia and let your hair down! There are so many attractions waiting for you, it would be a sin to stay at home! You just cannot miss the chance, as simple as that! Let’s get the countdown started! 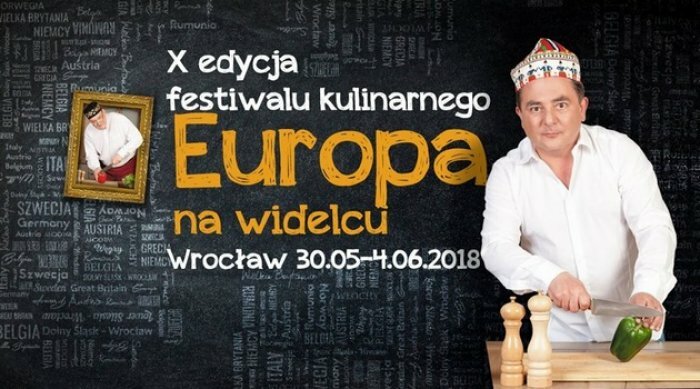 On 30 May, the jubilee, because already the 10th edition of the well-famed festival “Europa na widelcu” (Europe on the Fork) shall take its beginning. And the ambassador of this grand event is not just anybody, it’s the renowned cook Robert Makłowicz himself! This year, the festival will last as many as six fabulous days, can you believe it?A fancy crowning of events is the great feast in the Old Market Square, planned for the 2nd of June. A chance to taste dishes from 10 countries of Europe? Don’t let it go! Check what Austria, France, Greece, Norway, Romania, Italy or Great Britain taste like! And as the tradition dictates, the feast shall begin with a spectacular parade of cooks from Wrocław and the whole of the Lower Silesia. Your mouth waters at the very thought of it all? So think about the cooking shows taking place on the festival stage all day long and the evening concert of the Polish lady of the song, Kayah! So magnetic, electric…. Everybody knows it! Flying and eating at the same time? Absurd, as it may seem, there’s a chance for you to try it, provided that you love the thrill of emotions! So, head for the Plac Solny (Salt Square) where the most extraordinary restaurant ever known to mankind shall find its place, the Dinner in The Sky, hanging high above the earth. Yes, dining is fine, yet a man does not live on food alone. Don’t hesitate to leave the Old Market Square for a while to visit the Centennial Hall on 3 June. At the foot of this historical building, there shall be the Family Picnic of Freedom held, and the Nowe Horyzonty Cinema (New Horizons Cinema) will show you some delicious films as a part of the Culinary Film Festival. Luckily, the organisers did not forget about kids either. That’s their holiday after all, isn’t it? On the Children’s Day, the City Public Library invites you all for special workshops and meetings with authors of children’s most beloved books. The Festival ends on Monday with the Great Wrocław Breakfast of Freedom in the Old Market Square. Are you coming to Wrocław with your merry Little Ones? Splendid idea! You can’t miss the Family Picnic on Children’s Day organized on 1 June on the Słodowa Island (Malt Island). Amongst the rich palette of attractions, there are such gems hidden as educational workshops, artistic classes, sports activities and many games or animations to choose from. Worth a try is also the Dąbie Depot where on Saturday, 2 June, there shall be the Exhibition of Old Tramways, Buses and Cars for you to admire. Traditionally, a trip to the Wrocław Zoo and Africarium as well as the Parrot Aviary are recommended. The latter is located just 5 minutes away on foot from the Patio Hotel. And what’s waiting for you here, at the Patio Hotel? Freshly renovated suites and comfortable rooms, both LUX and TWIN ones. And you know what? You couldn’t have made a better choice when looking for accommodation. Our facility is barely a few step away from the heart of events! Check also our special offer for LONG JUNE WEEKEND. Don’t lose time, reach for the cosiness and see you soon!